New changes have arrived to Toluna! Explore the site in a new way, with two streamlined menus. Click on Explore to shop in the Rewards Centre, discover new content, create content, and browse Test Products. Click on the blue Create button from any page on the site to start creating content. Click on Surveys to access your Survey Centre, participate in sponsored content, and complete your profile surveys – everything to win you even more points! 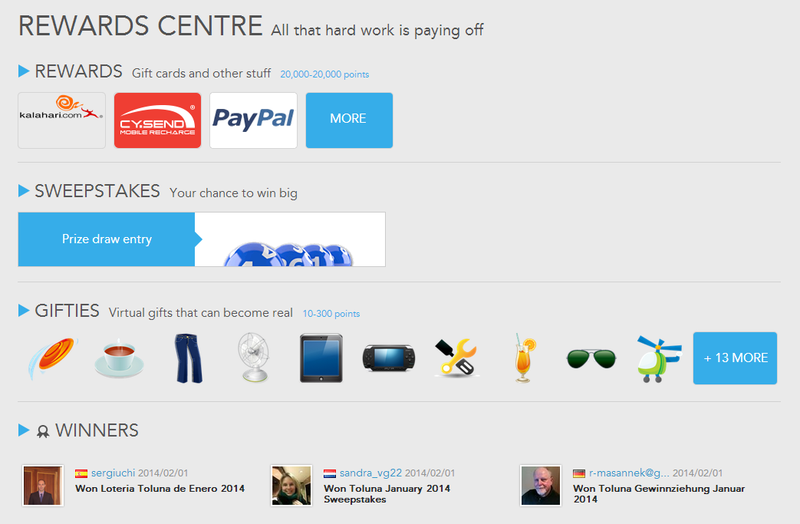 Welcome to your brand new Rewards Centre! Quickly browse rewards, ongoing sweepstakes, Gifties, and previous sweepstakes winners. Or, if you want to spend some more time window shopping the Rewards or browsing the winners, click on the blue arrows on the left-hand side to see all available options in each category. We hope you enjoy these new changes as much as we do.